Snapping turtles get their name from their powerful jaws. A turtle setting out to lay eggs tends to have something of an attitude as well. These turtles spend their lives in water until the female is ready to lay her eggs. Only then does she go out on land to select a spot to deposit her eggs. 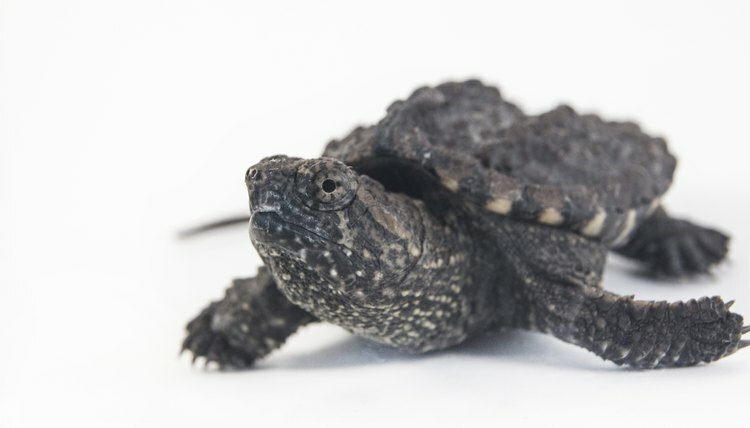 Taking snapping turtle eggs from the wild requires a permit, so finding a local breeder is the easiest way to get started. Set up your incubator at a temperature between 70 and 72 degrees. You can use either a chick egg incubator or a reptile egg incubator for this purpose. Heat the eggs slightly cooler at 68 degrees and all of the eggs will hatch as female turtles. Set the temperature slightly warmer at 73 to 75 degrees and the baby turtles will end up as male. At the middle temperatures you get both male and female turtles. Move the freshly laid snapping turtle eggs into the incubator within a few hours of been laid. Mark the tops with a soft pencil to make sure you don't turn the eggs as this kills the developing embryos. Carry the eggs tucked inside a small box filled with soil, making sure not to jostle them. Position the eggs in your incubator exactly the way they were in the box, with the tops facing upward. Secure the egg positions with a little sand carefully poured around each egg, or wrap them gently in tissue paper. Small egg cups can be used for this purpose. The eggs must remain this way for 60 to 80 days before hatching. Sometimes the eggs will go a little longer before hatching. Make sure that there is always water inside the incubator, by keeping the built-in water reservoir filled at all times. Snapping turtles are water turtles so they require high humidity for proper development. Egg shells that shrivel, or grow harder require more water. Water droplets forming on the inside of the incubator means there is too much water. Open the vents a little to allow some evaporation. Turtle eggs are delicate so handle them gently. Don't shake them as this kills the embryo. Don't handle the freshly hatched turtles too often. They have soft shells at first and can be harmed if squeezed.